Bicycle! Bicycle! : A Tisket, A Tasket, There's Disappointment in my Basket. A Tisket, A Tasket, There's Disappointment in my Basket. Can you see it? Perhaps if I put this here. Can you spot the difference? As the shop where I bought the Pashley only offered one frame size I do not know whether the basket sizes up with each frame (but I have a medium, anyway - not a small!) or of this is an export thing or a cost cutting measure. All I know is that the basket is barely large enough to carry a modest handbag and that's part of the reason why I swapped it for a beefy Bontrager clip-on. It's the gap I find most annoying. 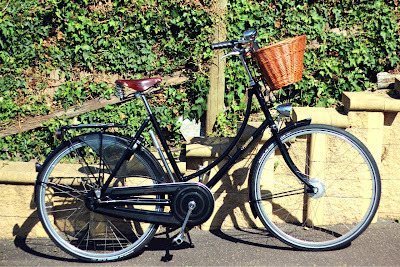 It's such a pretty bicycle, so well proportioned and carefully accessorised until you get to the inadequate basket. A basket so puny, it looks like an after-thought. 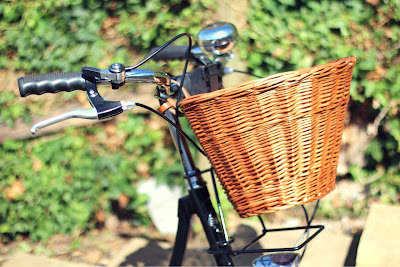 I'd love to buy a properly giant, leather strapped basket to replace it. Unfortunately there is no way to source that locally and it's sort of hard to find web sites that will list the dimensions of any wicker baskets they might be selling. It's even harder to find a 'D' shaped basket like the Pashley original. One day I hope to remedy this problem but for now I'll keep hauling in the Bontrager, which despite being a handlebar mounted clip-on comes so close to touching the basket support that it gives the illusion of correct 'basketude'. Until then I'll put my disappointment and the original basket on a shelf. Hello. 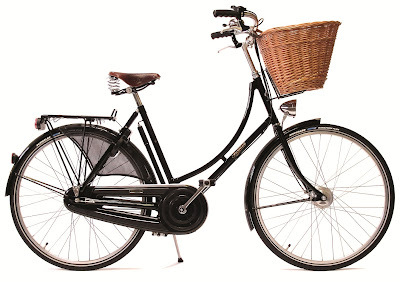 Just in case you still want to get the correct large Pashley basket for your bike, might I suggest contacting http://velo-ideale.com/ in New Zealand. I have dealt with them, and the owner, David Whittam is very helpful. The baskets are indeed available in 2 sizes, and you should get a choice between large & small when you buy your bike. I'm sure David would be able to help you get the large basket.